Janmashtami is the festival which is celebrated by the people of India every year. This day is celebrated as the birth of Lord Krishna. It is also known as Satam-atham. The people make pyramid and break the earthen pot (handi) filled with buttermilk (makhan). People come from various parts of the world to enjoy the festivals. This festival is celebrated in Mathura as well as Vrindavan in their traditions. 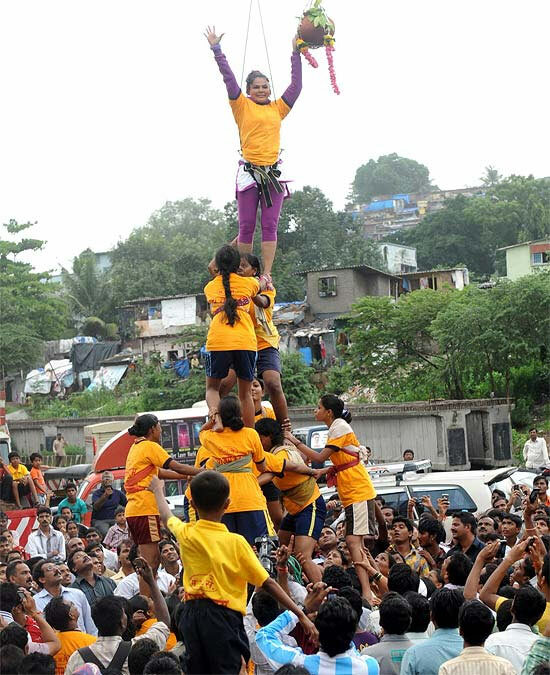 The human pyramid which are made are known as govindas. Now-a-days these festivals have taken a political flavors. They keep money prizes in lakhs so that they become point of attraction and many film stars come and celebrate this festival. Around 4000 handis are broken by govindas in Mumbai every year. There are big hoardings and banners of the politician then the gods. This festival is celebrated in different parts of the India in different ways. Today all the people are enjoying this festival as there is day off too.